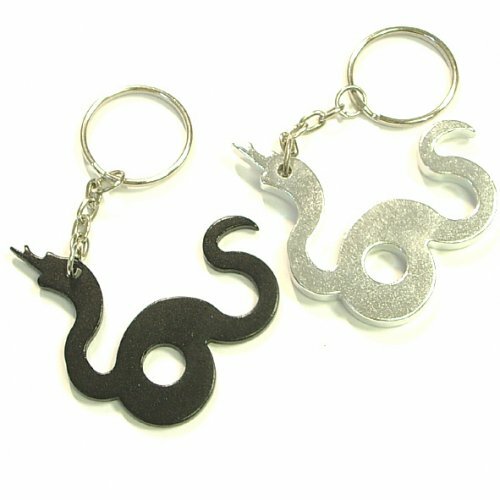 Crawl out of your holed surroundings by availing this custom snake shape bottle opener animal keychain! This Chinese animal zodiac keychain can be gifted during parties, social events, anniversary dos, etc. It is perfect for enticing youth during tradeshows, community parades, and many more. This snake shape bottle opener keychain makes a viable choice for individual or complimentary token. The keychain offers stellar surface area for marketers to act upon. Huge appreciation and price savings can be availed by distributing this snake shape bottle opener during your next campaign. Request for a quote to know price savings on wholesale promotional snake shape bottle opener animal keychain. Features – Snake shape bottle opener with key ring in metallic finish. Product Size – 2 1/4" x 1 3/4"
Imprint Area :3/16" x 1", 3/16" x 1/2"
Product Size :2 1/4" x 1 3/4"